Learning to feed myself was very messy but it was one of the most satisfying marks of maturity that I have enjoyed in my entire life! Very often over the last 20 years I have fed myself too much, and not the right kinds of good nutritious foods. Now I am trying to learn new disciplines about diet and food so that I can lower my weight to a healthy number. Early in my Christian life I was taught to feed myself spiritually. Thankfully it is not an area of my life that I have neglected or abused in my later years. I enjoy tremendous spiritual health and vitality in spite of my many physical maladies. 12) For when for the time ye ought to be teachers, ye have need that one teach you again which be the first principles of the oracles of God; and are become such as have need of milk, and not of strong meat. 13) For every one that requires milk is unskilful in the word of righteousness: for he is a baby. 14) But strong meat belongs to those who are of full age, even those who by reason of use have their senses exercised to discern both good and evil. 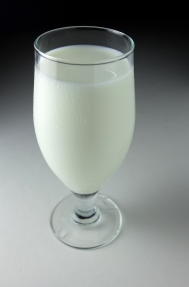 When you see the word milk in that Bible passage, do not conjure up an image of a little girl sipping a tall cool glass of lactose . . . . with the words “Got Milk?” at the bottom. Photo by Fidler Jan. MorgueFile. It is more likely the picture that the writer of Hebrews had in mind! The pastor in Hebrews is actually being very insulting! (It is what we pastors do!) He is reprimanding members of his flock for not acting like they were of "full age" and that they still didn't know the difference between "good and evil." He said, "I should be able to throw strong meat at you" (and he no doubt was doing so),"but you are starving, malnourished, and underfed because you can't feed yourself! You can't chew. You are asking to continue to be breast fed." I am grateful for my own former pastors, my teachers, professors, and mentors. They nursed me while I was a baby Christian, but I learned how to feed myself! The pastor in Hebrews describes this skill as something that all Christians must learn to do. The Shepherd can only lead the Lord's sheep to pasture (which is God's command to him), but he cannot put the grass and water and other nourishment in their mouth. They must all learn to graze, or they will die, at no fault of the Shepherd. I am a pastor now, but I still claim the responsibility for my own spiritual health, growth, strength and vitality. I maintain particular disciplines (I am a disciple, before and after all) to insure that I get the food from God that he wants me to have every day. There are still many people whom I respect and admire as preachers, pastors, and teachers . . . and I go to them often for the food from the Word of God that they deliver . . . . but it is my responsibility as a Grown Up Believer to feed myself. I've gotten now, so that I don't even get it all over me when I eat! Here are some of the things that I do, not as a part of my pastoral study or my ministerial preparation. These are things that I have been doing ever since I grew up! of Learning to Feed Yourself is Messy!